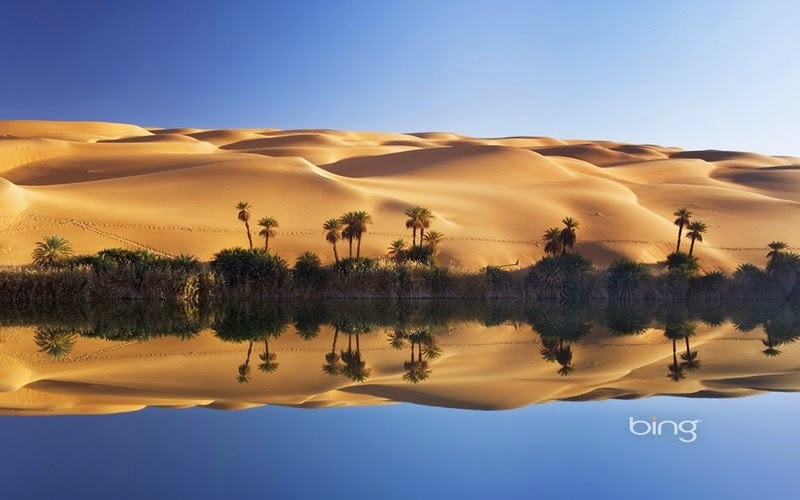 Ubari Lakes in the Libyan part of the Sahara desert on the right are among the most beautiful oasis in the world. The largest of these is Lake Umm Al-Maa, which means "Mother of Waters." The water in it is very salty - concentration can be compared with the water of the Dead Sea. Uniqueness lake also consists in the fact that the lower layers is always very hot water, the temperature sometimes reaches to 100 degrees, and wherein the upper layers are cold. 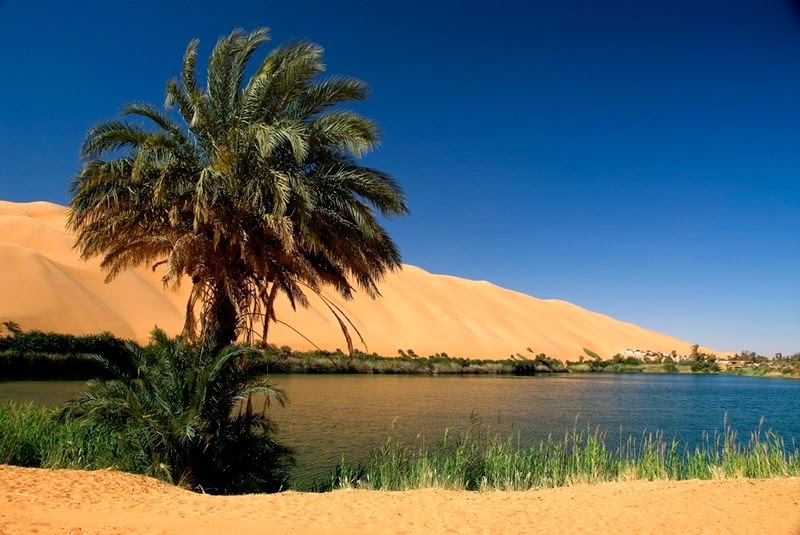 Ubari Lakes - a group of about 20 lakes of the landscape of high dunes and palm trees. To achieve these lakes, tourists usually go to Tkerkiba where excellent camping functions to explore the lake. 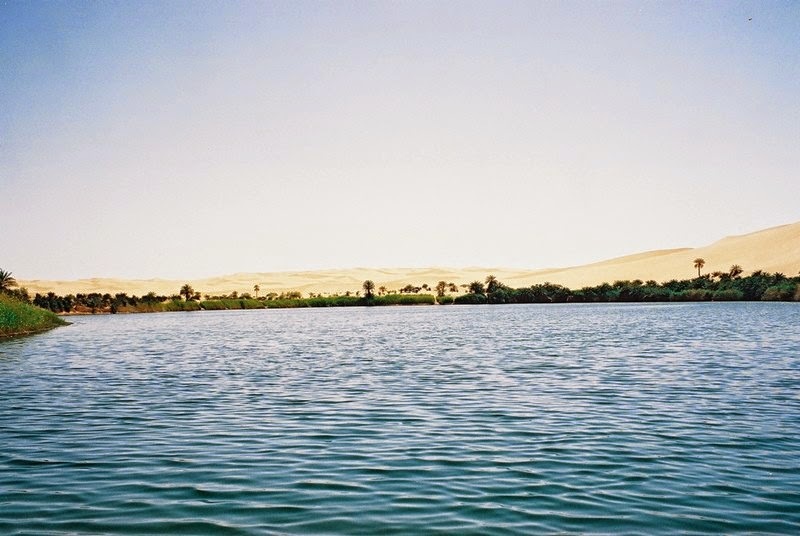 Depth of the lakes, according to the Libyan Central diving varies from seven meters deep (as in Gabrun) up to 32 meters deep (Ain al-Dibbanah about Ghadames). Some of these lakes are drying up due to drought slowly and artificial drainage. Among the most picturesque lakes Gaberun and Umm al-Maa. Also there are two more beautiful lakes that are rarely visited by tourists. This Umm al-Hisan and Oum El Hassan north Gaberuna. 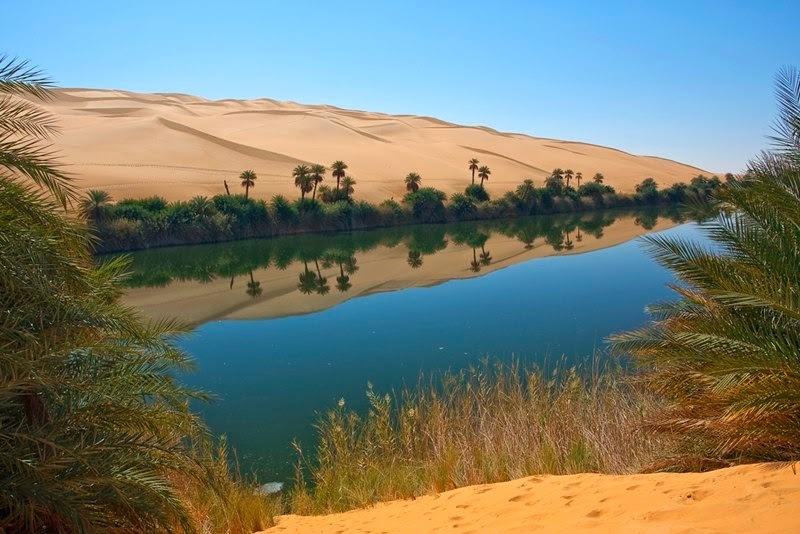 Recent archaeological research has shown the existence of several freshwater lakes in ancient Fezzan, Libya. Some of these lakes were located in the southern regions of the country. Archaeological finds from the area include dark layers of organic matter, shells, axes and other Paleolithic and Neolithic tools and implements, testifying that ancient human activities in Fezzan. These lakes were part of a large network of lakes, including the legendary Tritonis nearby Lake and Lake Chad. The exact dating of the lakes are still not confirmed, but the current study showed that they disappeared about 3,000 years ago. Findings also suggest that the impressive dunes Ubari at least 100,000 years. Numerous lakes covered the eastern and southern regions, and some of them still exist today. 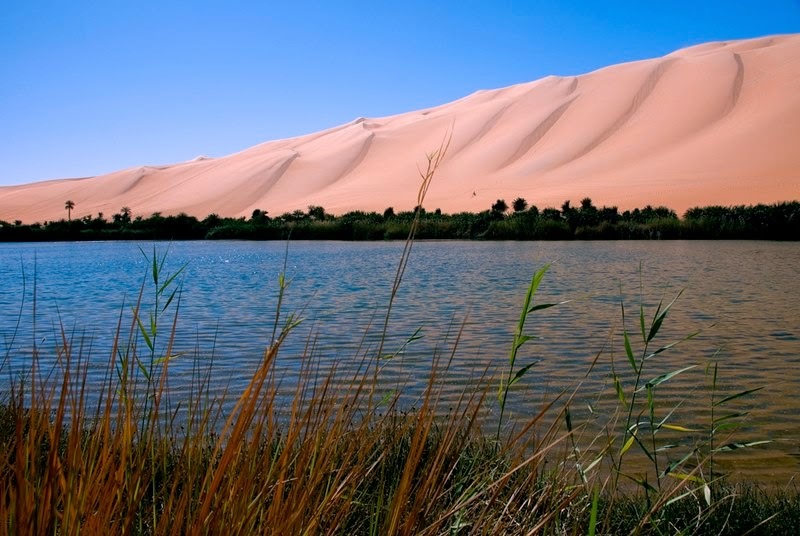 The current lake Ubari situated in a little oasis, and represent the remnants of a once great aquatic ecosystem. Complex of lakes greatest interest for eco-tourism are lakes Umm al-Maa and Gaberun. 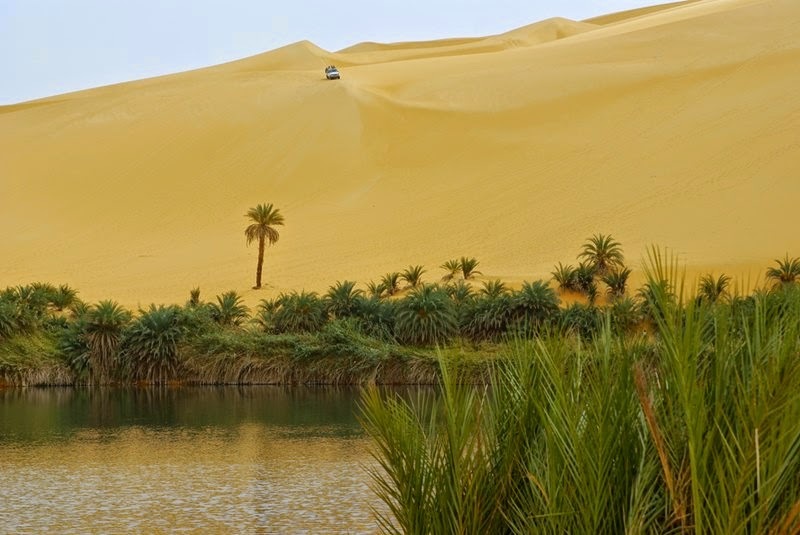 Ubari oasis in the Sahara desertHere to attract tourists broken camping tents and installed with souvenir products and the necessary devices for monitoring and research of the natural attractions of Libya. 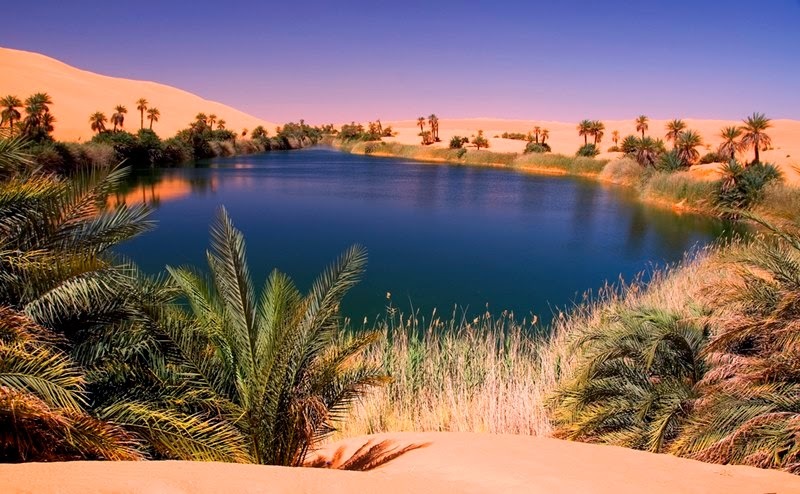 The smallest lake is considered - Gaberun, and its depth is 7 m Deepest - Ain al-Dibbanah, Ubari oasis, Sahara, Libyadepth 32 m Have salt in water equal to its concentration in the Dead Sea. Hallmark Ubari Lakes is the temperature difference in the depth and on the surface of water. 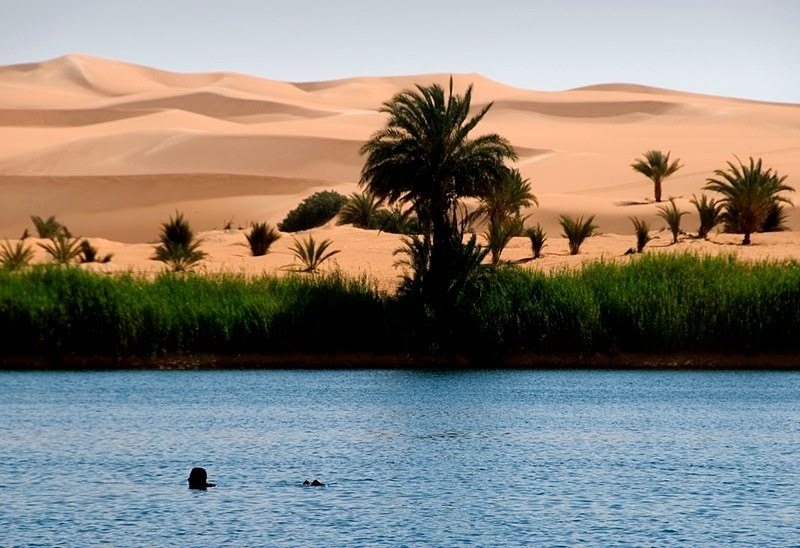 Lake Ubari, Sahara, LibyaThus, the bottom temperature can be 100 degrees, usually cold surface. 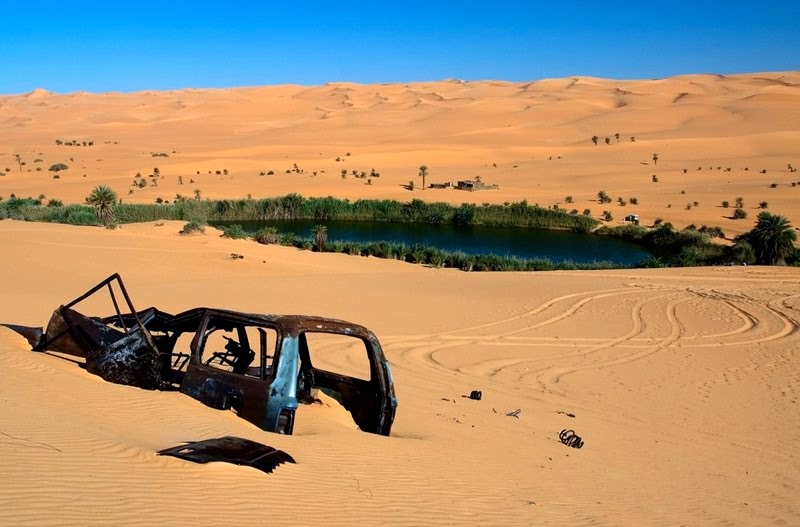 Unpleasant to realize that over time, an oasis may disappear due to natural and man-made factors. Unfortunately, the lake gradually dry up. Some, such as Lake Mandara, filled with water only in the winter time and not every year.